Robert Motherwell was born in Aberdeen, Washington on January 24, 1915, the first child of Robert Burns Motherwell II and Margaret Hogan Motherwell. The family later moved to San Francisco, where Motherwell's father served as president of Wells Fargo Bank. Due to the artist's asthmatic condition, Motherwell was reared largely on the Pacific Coast and spent most of his school years in California. There he developed a love for the broad spaces and bright colours that later emerged as essential characteristics of his abstract paintings (ultramarine blue of the sky and yellow ochre of Californian hills). His later concern with themes of mortality can likewise be traced to his frail health as a child. It was Matta who introduced Motherwell to the concept of "automatic" drawings. The Surrealists often deployed the process of automatism, or abstract “automatic” doodling to tap into their unconscious. This concept had a lasting effect on Motherwell, but it was conceptually changed, when Motherwell met Wolfgang Paalen in Mexico and decided to prolong his stay and to spend several months in his studio. Motherwell's famous Mexican Sketchbook visually reflect this conceptual change: while the first drawings are somehow analyzing copies of examples by Matta and Yves Tanguy, the drawings, done in Paalen's atelier or during his studies with Paalen show more plane graphic cadences, swelling ink-spots as a pictorial access to yet unseen or possible figurations, remembering the fumage-spots which also relinquished traditional aspects of perspective and suggested swelling ephemeral shapes. It was also Paalen who introduced Motherwell to André Breton with an introduction letter. The consequences and influences on various levels and on other American painters such as Jackson Pollock, Lee Krasner and William Baziotes, whom Motherwell befriended in New York after a trip to Mexico, are not finally explored. In 1991, shortly before he died, Motherwell remembered a "conspiracy of silence" regarding Paalen's innovative role in the genesis of Abstract Expressionism. Upon return from Mexico Motherwell spent time developing his creative principle based on automatism: "what I realized was that Americans potentially could paint like angels but that there was no creative principle around, so that everybody who liked modern art was copying it. Gorky was copying Picasso. Pollock was copying Picasso. De Kooning was copying Picasso. I mean I say this unqualifiedly. I was painting French intimate pictures or whatever. And all we needed was a creative principle, I mean something that would mobilize this capacity to paint in a creative way, and that's what Europe had that we hadn't had; we had always followed in their wake. And I thought of all the possibilities of free association—because I also had a psychoanalytic background and I understood the implications—might be the best chance to really make something entirely new which everybody agreed was the thing to do." Thus, in the early 1940s, Robert Motherwell played a significant role in laying the foundations for the new movement of Abstract Expressionism (or the New York School): "Matta wanted to start a revolution, a movement, within Surrealism. He asked me to find some other American artists that would help start a new movement. It was then that Baziotes and I went to see Pollock and de Kooning and Hofmann and Kamrowski and Busa and several other people. And if we could come with something. Peggy Guggenheim who liked us said that she would put on a show of this new business. And so I went around explaining the theory of automatism to everybody because the only way that you could have a movement was that it had some common principle. It sort of all began that way." In 1942 Motherwell began to exhibit his work in New York and in 1944 he had his first one-man show at Peggy Guggenheim's "Art of This Century" gallery; that same year the MoMA was the first museum to purchase one of his works. From the mid-1940s, Motherwell became the leading spokesman for avant-garde art in America. His circle came to include William Baziotes, David Hare, Barnett Newman, and Mark Rothko, with whom he eventually started the Subjects of the Artist School (1948–49). In 1949 Motherwell divorced Maria Emilia Ferreira y Moyeros and in 1950 he married Betty Little, with whom he had two daughters. In 1948, he began to work with his celebrated Elegy to the Spanish Republic theme, which he continued to develop throughout his life. Motherwell intended his Elegies to the Spanish Republic as a "lamentation or funeral song" after the Spanish Civil War. His recurring motif here is vertical ovals and rectangles, repeated in varying sizes and degrees of compression and distortion. They have various associations, but Motherwell himself related them to the display of the dead bull's testicles in the Spanish bullfighting ring. Elegy to the Spanish Republic No. 110 from 1971, in the collection of the Solomon R. Guggenheim Museum is typical of this series. Throughout the 1950s Motherwell also taught painting at Hunter College in New York and at Black Mountain College in North Carolina. Cy Twombly, Robert Rauschenberg and Kenneth Noland studied under and were influenced by Motherwell. At this time, he was a prolific writer and lecturer, and in addition to directing the influential Documents of Modern Art Series, he edited The Dada Painters and Poets: An Anthology, which was published in 1951. From 1954 to 1958, during the break-up of his second marriage, he worked on a small series of paintings which incorporated the words Je t'aime, expressing his most intimate and private feelings. His collages began to incorporate material from his studio such as cigarette packets and labels becoming records of his daily life. He was married for the third time, from 1958 to 1971, to Helen Frankenthaler, a successful abstract painter. In 1958–59, Motherwell was included in "The New American Painting" exhibition, initiated by the Museum of Modern Art, which traveled across Europe. That year he traveled in Spain and France, where he started his Iberia series. During the 1960s, Motherwell exhibited widely in both America and Europe and in 1965 he was given a major retrospective exhibition at the Museum of Modern Art; this show subsequently traveled to Amsterdam, London, Brussels, Essen, and Turin. In 1962, Motherwell and Helen Frankenthaler spent the summer at the artists' colony at Provincetown, Massachusetts, where the coastline inspired the Beside the Sea series of 64 paintings, the oil paint splashed with full force imitating the sea crashing on the shore in front of his studio. The 1963 untitled oil on canvas painting in the collection of the Honolulu Museum of Art exemplifies this stage in the artist's career. In 1964, Motherwell created a mural-sized painting entitled Dublin 1916, with Black and Tan, which is in the Governor Nelson A. Rockefeller Empire State Plaza Art Collection in Albany, NY. The size and content suggest that Motherwell intended to create a monument to heroism in the tradition of Picasso's Guernica. 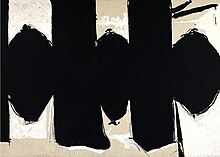 In 1965 Motherwell worked on another prominent series called the "Lyric Suite", named after Alban Berg's string quartet. Motherwell recalled, "I went to a Japanese store to buy a toy for a friend's kid, and I saw this beautiful Japanese paper and I bought a thousand sheets. And made up my mind, this was in the beginning of April 1965, that I would do the thousand sheets without correction. I'd make an absolute rule for myself. And I got to 600 in April and May, when one night my wife and I were having dinner and the telephone rang. And it was Kenneth Noland in Vermont saying that I should come immediately. And I said, 'what's happened?' And he said, 'David Smith's been in an accident'." Smith, the sculptor, was Motherwell and Frankenthaler's great friend. Jumping into their Mercedes they sped to Vermont but arrived 15 minutes after Smith had died. Motherwell stopped work on the series. He said of them: "And then one year I had them all framed, and I like them very much now. I should also say that I half painted them and they half painted themselves. I'd never used rice paper before except occasionally as an element in a collage. And most of these were made with very small, I mean very thin lines. And then I would look at amazement on the floor after I' finished. It would spread like spots of oil and fill all kinds of strange dimensions." In 1967, Robert Motherwell began to work on his Open series. Inspired by a chance juxtaposition of a large and small canvas, the Open paintings occupied Motherwell for nearly two decades. Intimate and meditative, the Opens consist of limited planes of colour, broken up by minimally rendered lines in loosely rectangular configurations. As the series progressed, the works became more complex and more obviously painterly, as Motherwell worked through the possible permutations of such reduced means. The late 1960s saw Motherwell using Gauloises packets and cartons in many collages, including an extensive series with the packets surrounded by bright red acrylic paint, often with incised lines in the painted areas. In the introduction to his 2015 book Robert Motherwell, The Making of an American Giant, gallery owner Bernard Jacobson says, "Motherwell smoked Lucky Strikes, but in his collage life he smokes Gauloises, around whose blue packets he now organises one composition after another, 'exotic to me precisely because in the normal course of things I don't smoke French cigarettes'." And by incorporating Gauloises packets he makes deft and condensed allusion to "French blue": to the Mediterranean and the palette of Matisse ... to the smoke coiling up in a Cubist assemblage." In 1972, Motherwell married the artist-photographer Renate Motherwell and moved to Greenwich, Connecticut, where they lived in a carriage house with a hayloft aerie, a beautiful old barn and a gabled guest cottage adjoining a one-hundred-foot-long studio—the whole surrounded by verdant parklike grounds. During the 1970s, he had important retrospective exhibitions in a number of European cities, including Düsseldorf, Stockholm, Vienna, Paris, Edinburgh, and London. In 1977, Motherwell was given a major mural commission for the new wing of the National Gallery of Art, Washington, D.C. In 1983, a major retrospective exhibition of Motherwell's work was mounted at the Albright-Knox Art Gallery in Buffalo, New York; this exhibition was subsequently shown in Los Angeles, San Francisco, Seattle, Washington, D.C., and New York City. Another retrospective was shown in Mexico City, Monterey, and Fort Worth, Texas, in 1991. In 1988, Motherwell worked with the publisher Andrew Hoyem of Arion Press on a limited edition of the modernist novel Ulysses, by James Joyce. Motherwell produced 40 lithographs for the project. Motherwell was a member of the editorial board of the surrealist magazine VVV and a contributor of Wolfgang Paalen's journal DYN, which was edited 1942-44 in six numbers. He also edited Paalen's collected essays Form and Sense in 1945 as the first Number of Problems of Contemporary Art. Motherwell died in Provincetown, Massachusetts on July 16, 1991. On his death, Clement Greenberg, the great champion of the New York School, left in little doubt his esteem for the artist, commenting that, "although he is underrated today, in my opinion he was one of the very best of the Abstract Expressionist painters". The Dedalus Foundation was set up by Robert Motherwell in 1981 to educate the public by fostering public understanding of modern art and modernism through its support of research, education, publications, and exhibitions in this field.When Motherwell died on July 16, 1991, he left an estate then estimated at more than $25 million and more than 1,000 works of art, not including prints. His will was filed for probate in Greenwich and named as executors his widow, Renate Ponsold Motherwell, and longtime friend Richard Rubin, a professor of political science at Swarthmore College. On July 20, 1991, several hundred people attended a memorial service for Motherwell on the beach outside his Provincetown home. Among them were the writer Norman Mailer and the photographer Joel Meyerowitz, both Provincetown summer residents. Speakers included the poet Stanley Kunitz, who read a poem that was a favorite of Motherwell's, William Butler Yeats's Sailing to Byzantium; Senator Howard Metzenbaum, Democrat of Ohio, an acquaintance of Motherwell's; and other artists, friends, and family members. Art Gallery of Ontario, Canada (2011); Museum Morsbroich, Leverkusen, Germany (2004–05); Fundació Antoni Tàpies, Barcelona, Spain (1996–97, traveled); Museo Rufino Tamayo, Mexico City, Mexico (1991–92, traveled); Walker Art Center, Minneapolis, Minnesota (1985); Albright-Knox At Gallery, Buffalo, New York (1983, traveled); Fundación Juan March, Madrid, Spain (1980); the William Benton Museum of Art, University of Connecticut, Storrs (1979); Royal Academy of Art, London, England (1978); Musée d'art moderne de la ville de Paris, France (1977); Stadtisches Kunsthalle, Düsseldorf, Germany (1976); Museo de Arte Moderna, Mexico City, Mexico (1975); Princeton University Art Museum, New Jersey (1973); David Mirvish Gallery, Toronto, Ontario, Canada (1973); The Museum of Fine Arts, Houston, Texas (1972–73, traveled); The Museum of Modern Art, New York (1965); The Phillips Collection, Washington, D.C. (1965); Smith College Museum of Art (1963); Pasadena Art Museum, California (1962); Galerie Heinz Berggruen, Paris, France (1961); Bennington College, Bennington, Vermont (1957); Peggy Guggenheim's Art of this Century Gallery, New York (1944). ^ Mattison, Robert S. (2009). Robert Motherwell : Open. London: 21 Publishing. p. 10. ISBN 978-1-901785-12-8. ^ Robert Motherwell : Open. London: 21 Publishing. 2009. p. 169. ISBN 978-1-901785-12-8. ^ a b Archives of American Art. "Oral history interview with Robert Motherwell, 1971 Nov. 24-1974 May 1 - Oral Histories | Archives of American Art, Smithsonian Institution". Aaa.si.edu. Retrieved 2011-12-07. ^ "Robert Motherwell. The Little Spanish Prison. 1941-44". The Collection | MoMA. MoMA. Retrieved 15 January 2016. ^ "Robert Motherwell. Pancho Villa, Dead and Alive. 1943". The Collection | MoMA. MoMA. Retrieved 16 January 2016. ^ Andreas Neufert, Auf Liebe und Tod. Das Leben des Surrealisten Wolfgang Paalen, Berlin (Parthas) 2015, p. 465f. ^ Mattison, Robert S. "Robert Motherwell". Oxford University Press. Retrieved March 8, 2011. ^ Cummins, Paul. "Oral history interview with Robert Motherwell, 1971 Nov. 24-1974 May 1". Archives of American Art. Smithsonian Institution. Retrieved March 8, 2011. ^ Caws, Mary Ann (2003). Robert Motherwell : with pen and brush. London: Reaktion. p. 17. ISBN 1-86189-141-5. ^ "The Collection | Robert Motherwell. Elegy to the Spanish Republic, 108. 1965-67". MoMA. Retrieved 2011-12-07. ^ a b "Biography". The Dedalus Foundation. Archived from the original on 2012-01-04. Retrieved 2011-12-07. ^ a b "Bernard Jacobson Gallery". Jacobsongallery.com. Retrieved 2011-12-07. ^ The Empire State Collection: Art for the Public. Harry N Abrams Inc. October 1, 1987. p. 116. ISBN 0810908840. ^ Young, Dennis. "Interview with Robert Mothwerwell, AGO, 1970". ^ "Bernard Jacobson Gallery". Jacobsongallery.com. Retrieved 2011-12-07. ^ "Robert Motherwell & Gauloises Caporal | BEACH". Beachpackagingdesign.com. 22 December 2010. Retrieved 5 March 2016. ^ "Robert Motherwell. Gauloises Bleues (White). 1970". MoMA. 22 February 2010. Retrieved 5 March 2016. ^ "Robert Motherwell: Making of an American Giant-artnet News". News.artnet.com. Retrieved 5 March 2016. ^ "Robert Motherwell | Gauloises with Scarlet No. 1 (1972)". Artsy. Retrieved 5 March 2016. ^ Glenn, Constance W. "Robert Motherwell, 1984". Architectural Digest. Architectural Digest. Retrieved 8 December 2015. ^ Glueck, Grace (July 18, 1991). "Robert Motherwell, Master of Abstract, Dies". The New York Times. Retrieved April 29, 2013. Note correction at the bottom of the page. ^ a b Grace Glueck (July 29, 1991), Motherwell Estate Is Estimated to Be $25 Million New York Times. Motherwell, Robert, Engberg, Siri and Joan Banach. Robert Motherwell: The Complete Prints 1940–1991. Minneapolis: Walker Art Center, 2003.